The American Country Awards are fan voted, so it's up to us to see that Chris comes out on top in two categories, Video of the Year and Male Video of the Year. Voting ends November 8 so take a moment to vote daily. Click on the banner above and please share the info with others. The AMERICAN COUNTRY AWARDS will air live from the MGM Grand Garden Arena in Las Vegas Monday, Dec. 6 (8:00-10:00 PM ET live/PT tape-delayed) on FOX. If you'd like to see Chris win an award(s), you've got to vote! Last night's show at The Pabst Theater in Milwaukee, WI was BEYOND AMAZING!!! I've been a fan since Nashville Star and hadn't seen a Chris show since a few years ago when he was at Country Thunder in Twin Lakes, WI which is where I first had the opportunity to meet Chris through a fan club meet and greet! I got there, went to the merchandise table to pick up my meet and greet and it was cool to find out that it was Chris' dad who handed me my pass! I definitely know why Chris is such a gentleman! His dad is exactly the same and it was cool to hear the story about how he met Chris' mom! Once his meet and greet was over I made it back to my seat and waited for the show to begin. I was so impressed with his performance and stage presence! After every song on the set list he said "Thank-You," which made me proud to be a Chris Young fan! He is extremely humble, and I cannot fail to mention that his vocal range is INCREDIBLE! Once again I was impressed with his performance. Beginning November 19 you can visit the Hall of Trees in the newly-renovated Opryland Hotel (opens November 15). This year Chris will have a tree decorated with ornaments handmade by his Nanny and mother. Underneath the tree will be lots of gifts with special touches from Chris, Nanny, Granddaddy, and Chris' Mom. Both the gifts and ornaments are valued at more than $2000 and all will go to the highest bidder with proceeds benefiting Chris' charity of choice, St. Jude Children's Hospital. Sshhh...We snuck a peek at some of the gifts under the tree and we're going to let you in on some of the unique collector's items you'll find --a handmade quilt that names Chris' hit songs and autographed by Chris and his Nanny, an autographed acoustic guitar, 2 tickets to the Opry with backstage meet and greet with Chris, and that's only the beginning. We don't want to give it all away so be sure to visit the Hall of Trees in person or view the trees online and place your bid at www.halloftrees.com. Bidding begins November 19 and runs through December 21. Click here to purchase your tickets to this fun holiday event. Adult tickets are $7 and Junior (age 4-11) tickets are $4. Are you aware of the three places (GAC Top 20, CMT Top 20, CMT 12-pack) you can vote for VOICES? Did you know there is a special campaign going on to send iTunes gift cards for the troops with Chris when he visits overseas? All of this and MORE can be found on the message board on the website, so c'mon over and check it out! 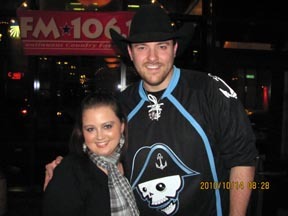 http://forum.chrisyoungcountry.com/. Fans also post their online Chris sightings, show reviews, and any new voting ops discovered between newsletters. All you have to do is register with a user name and password of your choice. See you on the board! Click on the Top 20 Countdown Viewers Poll on the left hand side. Voting is from Monday 11am (ET) through Sunday midnight (ET). You can vote as many times as you want! Vote once per day, per IP address! Click on the Pure 12-Pack Countdown: Voting for (date) on the left hand side. Voting is from approximately 1pm Eastern on Fridays through Thursday. 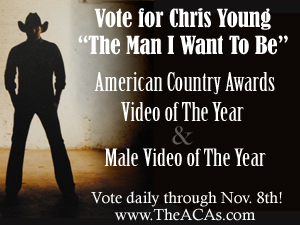 You can vote for up to 12 videos, but remember if you ONLY vote for Chris you won't be helping anyone beat him. You can vote as many times as you want. Set your recorders -- “Country Music’s Biggest Night(tm)” continues to get bigger as the first group of presenters is announced for “The 44th Annual CMA Awards.” You'll see Chris on the stage this year as a presenter. Chris received his first CMA nomination this year in the New Artist of the Year category. We've got our fingers crossed for him but as a presenter, we'll still see him on the stage and on the air. Will you be attending the live show in Nashville? If not, you can tune in to ABC as the “The 44th Annual CMA Awards” airs live from the Bridgestone Arena on December 10, 7 PM CST. RCA Nashville has released the original motion picture soundtrack to Country Strong. Film stars Gwyneth Paltrow, Tim McGraw, Garrett Hedlund, and Leighton Meester all contribute tracks to the collection. In addition to performances from the film stars, the album includes a duet with Chris and Patty Loveless titled LOVE DON'T LET ME DOWN. The CD is available at your local music stores and can also be downloaded on iTunes. The motion picture will be released in theatres in Los Angeles and Nashville on December 22 and nationwide on January 7. Would you like to send the gift of music to the troops in Iraq? 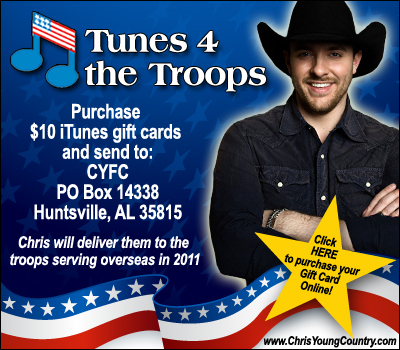 Chris will be visiting the troops in 2011 and we're collecting iTunes gift cards for him to hand out to the soldiers. All you have to do is purchase $10 iTunes gift cards and send them to the address listed in the banner above. Or to simplify, click on the banner above and purchase cards online. You will receive a thank you letter and small gift for your donation. This project is one most fans are able to participate in and the response has been awesome! Every card is appreciated so please keep them coming! After the show my friend and I made our way out to meet The Adam Craig Band whom were also great with their fans! As we turned around to head out the door my friend spotted Chris who was signing autographs and posing for pictures with fans! I thought once again that it was extremely generous of Chris to take more time out of his evening to meet with other fans, my friend Lisa actually walked away with a smile on her face because she FINALLY got to meet Chris and get a picture with him! I cannot say enough how wonderful it is to be a part of such a wonderful fan club for an AWESOME artist who deserves that CMA nomination for New Artist of the Year! If you'd like to be notified by email when the newsletter is published online, please send an email to ChrisYoungCountryNEWS@yahoo.com with your first and last name. Type ADD ME in the subject line. THE MAN I WANT TO BE is available in the Chris Young Online Store. Click the CD cover above to visit the store.